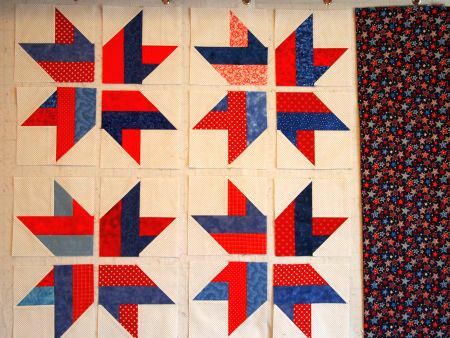 Because today is Memorial Day, I decided I should work on a patriotic quilt. I started this one at Ruth's Stitchery in January for "Quilts of Valor" day. I have enough blocks put together to make a lap quilt, or a quilt just the right size for a "rack" on an aircraft carrier! The pattern I'm using is from Cozy Quilts. It's called "Stars from Stripes." What a great way to use red and blue 2.5" strips! Here is my quilt on the design wall. 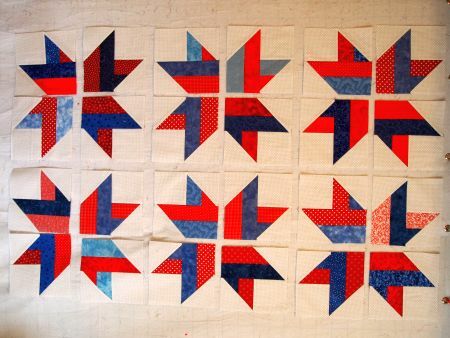 I will use the HSTs cut from the blocks for the middle border. Hope I have enough of the blue outer border fabric! I always light a blue candle for important "Navy days," such as the day the GW puts out to sea. 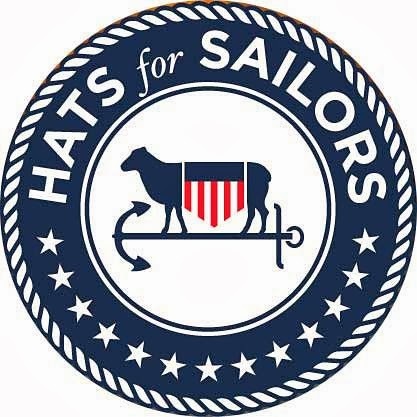 I have one burning today because it's Memorial Day, and I want to honor all Sailors who made the ultimate sacrifice for our country. Remember to comment on this post by Thursday for a chance to win my 500+ followers giveaway! Those star blocks are lovely. I'm currently looking for a pattern for a quilt to make for 'Help for Heros' here in the UK. This looks like a possible choice but there are so many to choose from. I like the idea of burning a candle on special Navy days. 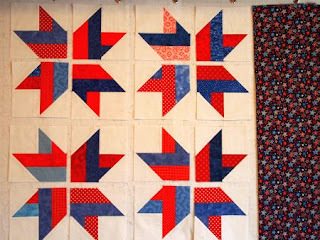 that is a very patriotic quilt - love the look of it! Great share! I bet it was a really nice surprise to get to Skype with Jacob too! Very cool! Very pretty...love the red the most! 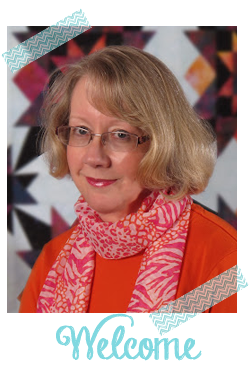 My local quilt guild is focusing on Quilts of Valor this year. This would be a great pattern to use up any of our left over patriotic fabric. Thanks for the suggestion.